Several weeks ago I saw a twitter post from food writer Michael Ruhlman, linking to a kickstarter campaign for a company called Underground Meats. 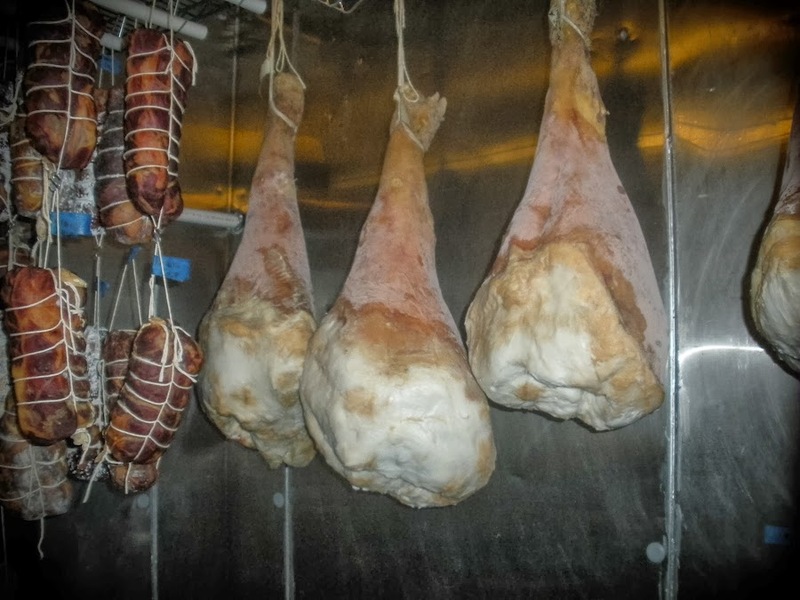 Underground Meats were looking for crowd-sourced funding to afford a HACCP program. HACCP is a food safety system of checks and balances, which ensures a safe end product. Originally, the program was developed by NASA when they recruited Pillsbury to produce food to send up to space for astronauts. Since then, HACCP (Hazard Analysis and Critical Control Points) has become the standard for national food producers. Having a HACCP program would allow Underground Meats, based in Madison, WI, to gain federal food certification. Right now they're just state certified, so being certified at a national level would open a huge amount of doors and avenues of distribution for them. So why should a guy in Pennsylvania care? It caught my attention because they wanted to release their HACCP experiences and final plan to the world, using Creative Commons. Most companies would never even think of doing this. After spending a few tens of thousands of dollars on getting an approved HACCP plan, companies keep them under lock and key, so they can compete in a limited market space, and thus recoup the costs of getting a HACCP plan. Think of pharmaceutical companies keeping their medication patents secret, so they can recoup the costs before generics force them to lower their prices. This was all interesting, but the company and it's meat processes really kept me reading. Underground Meats is the butchering/curing arm of Madison's Underground Food Collective, which does curing, catering, operates a local retail butcher shop, and runs the delicious and innovated restaurant Forequarter. They work with heritage animals, using the whole animal and breaking it down into its primal cuts, and then make a range of exceptionally delicious products. Best news? 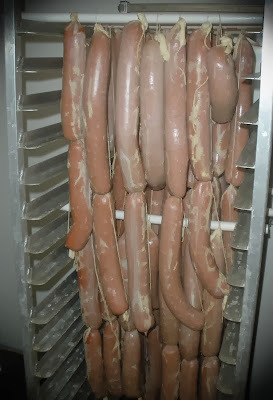 One of the kickstarter pledge levels came with three days of working at Underground Meats and learning about their cutting and curing. I was in. I was flying to Madison to meet up with the Underground crew and a fresh batch of Tamworth hogs. Working in a kitchen environment can be on the stressful side, but everyone at Underground Meats was incredibly friendly and generous with their time and advice. Besides creating a positive environment, that attitude really went into their care and work with the meat and resulting products. I mentioned to Underground that I wanted to get some hands on experience on curing whole muscles. They were more than happy to oblige, showing me how to cut out a culatello from the leg, how to roll a coppa out from the shoulder/neck, and where to cut the loin so your lomo isn't too dry. That was all on day one. Working with the whole muscles was one of the highlights for my trip, but I keep thinking about day three. On day three we made 180 lbs of goat salami. Technically it was a 240 lb batch, but 60 lbs were made the previous day. Imagine 180 lbs of goat. Not with bones and trimming and other viscera that will bring the total weight down to 120 or 140, but a solid 180 lbs of goat meat. You need to stuff that into natural casings, twist them into 4 oz links (rotating directions), make a set of 8 links, then cut it into 4 links and tie the first and second links with twine. 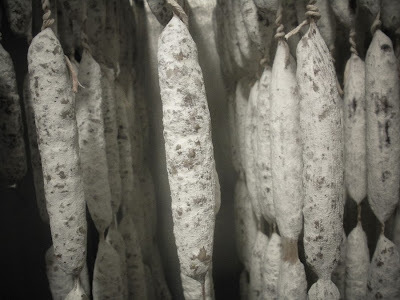 These links then get hung to dry and begin the first stages of curing. With the amount of work involved, I couldn't believe these guys weren't totally burned out and just said, "screw it, let's just make 5 lb bulk salami for deli slicers!" But despite the enormous job ahead of us, the Underground crew still made sure each link was as close to perfect as possible. During the hours of work involved in that task, two of the twine links slipped out of their knots and a string of four salami fell on the floor, earning them a place in the trash. I'm going to pin the blame on myself, as the guy I worked with, Tim, could spot a poor knot or an oversized twist on the spot. All I could think of was, "there goes all that work, into the trash." 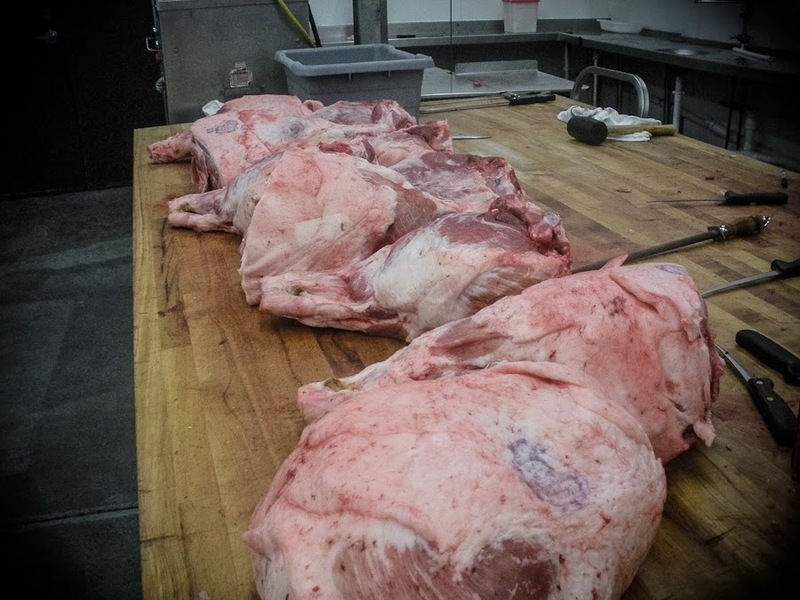 I hadn't been there for the cutting and boning of the goats, but I heard it's a big job, as goats are bonier than pigs, requiring more knifework to free up the meat from the bones and fat (the fat can be gamey and waxy, so it's removed). After that second link slipped loose, each of my knots was pulled tight enough to make my fingers hurt. To do this as a living takes serious dedication to your craft. In the four days there (I went for an extra day to keep learning as much as possible) I learned a huge amount about both the craft of curing and the legal requirements involved in professional curing. To keep this post from running on too much longer, I want to end with a conversation I had with one of Underground's group. Chris worked in a larger, old fashioned bratwurst and sausage plant in his youth, but came to Underground and really got to flex his creative muscles. "Right now we're creating recipes based on Italian or Spanish recipes, but I want us to be creating more cures that are unique to Wisconsin," he explained to me. To that goal, he's been working with a range of indigenous products. 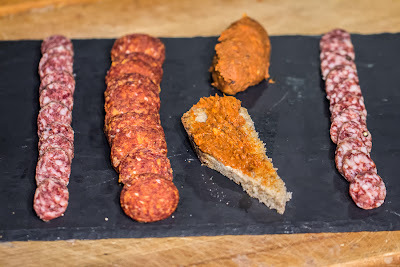 One particularly wild example (which was still curing at the time, so I didn't get a chance to try it), was his recipe for "Spruce Goat," which is a goat salami cured with local spruce tips. 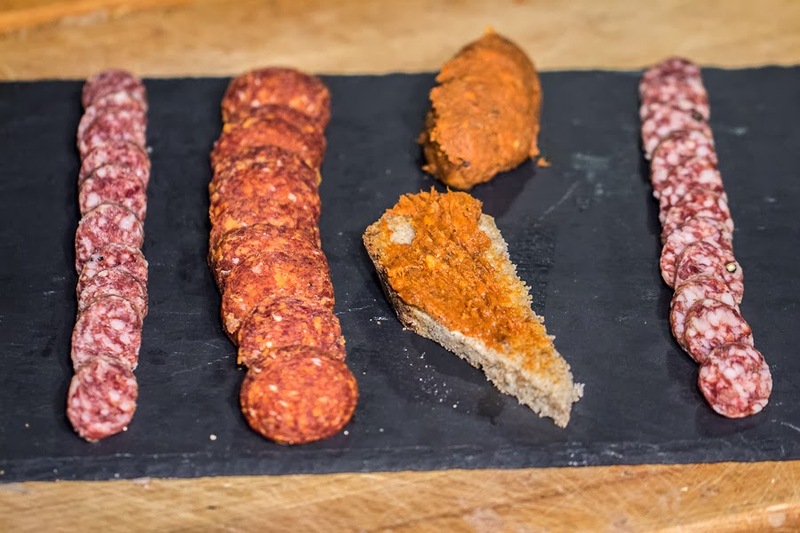 The spruce gives the salami a resinous quality, and plays off the second ingredient, a locally brewed lambic beer, which has piney, citrus notes from the hops and lambic yeast. I came back from the trip incredibly energized, and while I could write on and on, I'll wrap this up here. I'm confident you'll see references to Undergound Meats in upcoming posts as I work in their techniques. Otherwise, hopefully you'll be able to find them in specialty food shops soon, as they achieve their goal of national certification. Outstanding insight to the Underground Meat operation. The dedication to their craft is amazing. Culinary Pen continues to teach and share. Let us know what happens to their goal of federal certification; and, typically, how many supporters go through a similar "internship." Thanks so much! I think only 3 others signed up at this similar internship level.